We worked with the community to revitalise Dandenong Creek and uncover the rich history of the area. 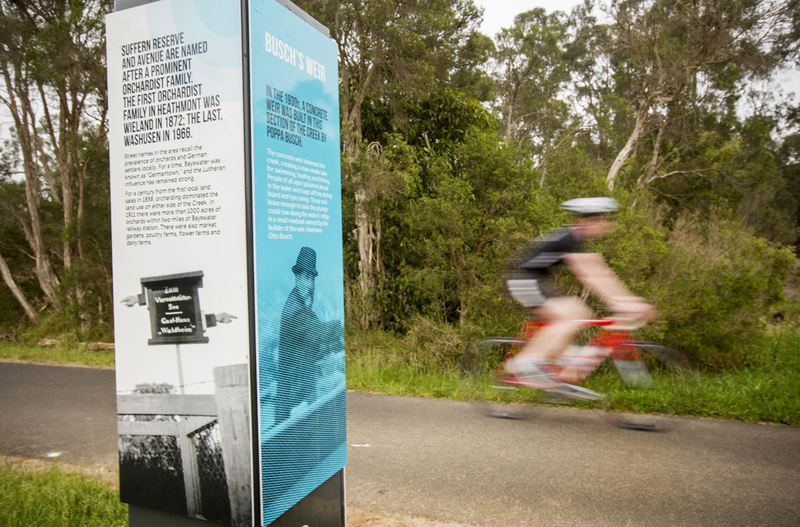 Next time you're bike riding, running or walking your dog, head down to Dandenong Creek and check out the billabongs and new interpretive signage. 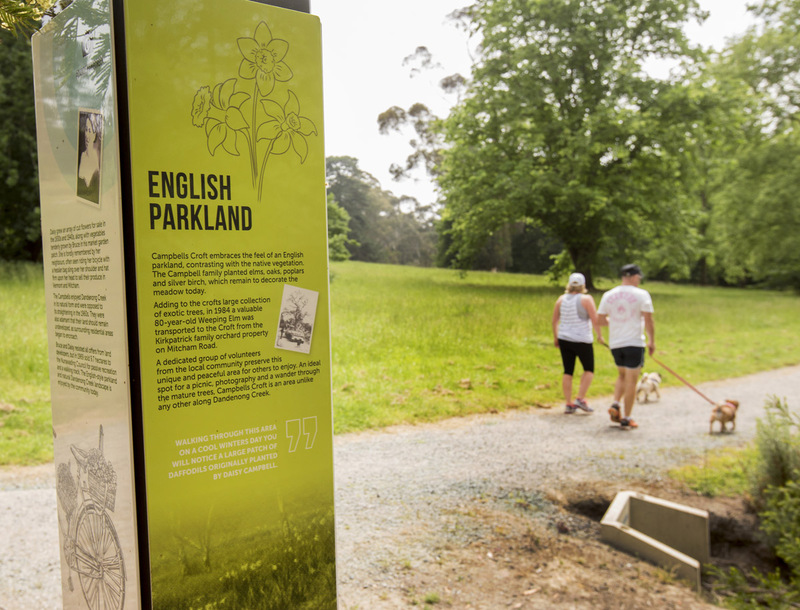 Together with the local community, Knox City Council and Maroondah City Council, we decided on a suite of works that seek to improve the natural amenity of Dandenong Creek and uncover the history of the area. This project includes the installation of recreational amenities such as historical signage, park benches and drinking fountains, as well as plans for billabong renewal. We would like to thank Heathmont History Group and Wurundjeri and Bunurong traditional owners for working with us to share the rich history of the area. As a result, 15 interpretive signs were installed along the creek showcasing the European and indigenous history, flora and fauna. 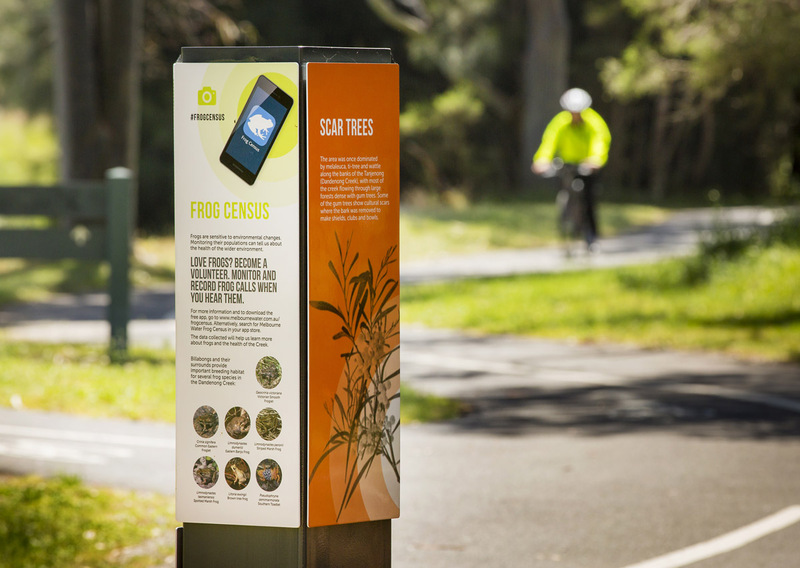 Some of these signs include artworks commissioned by Wurundjeri artist, Ash Firebrace. Hermann Otto Busch, an eccentric German migrant, built a concrete weir in the 1930s. This became a hot spot for city dwellers to visit during a weekend in the 'country'. Dandenong Police Paddocks Reserve was once the headquarters of the Indigenous trackers. Two young police officers, William and Henry Dana, made a name for themselves with their ability to track criminals to their secret hiding spots in the bush. The Campbells first settled in Dandenong Creek at the end of the 19th Century. The family refused to develop their land as they wanted to preserve its natural form. This English parkland continues to be enjoyed by the community today. Billabongs provide important breeding habitats for diverse frog species in Dandenong Creek. The Frog Census App collects data to help us learn more about frogs and the health of the creek. 1934 continues to hold the record for the largest flood in Dandenong Creek, with water levels at a all time high of 6.68m above creek level. Together with the Natural Amenity Working Group we identified that installing signage, amenities and revitalising billabongs along the creek corridor would be a key project. We worked with the Natural Amenity Working Group to identify, prioritise and design the billabong renewal project. We worked alongside Heathmont History Group and the Wurundjeri and Bunurong traditional owners to understand the history of Dandenong Creek. 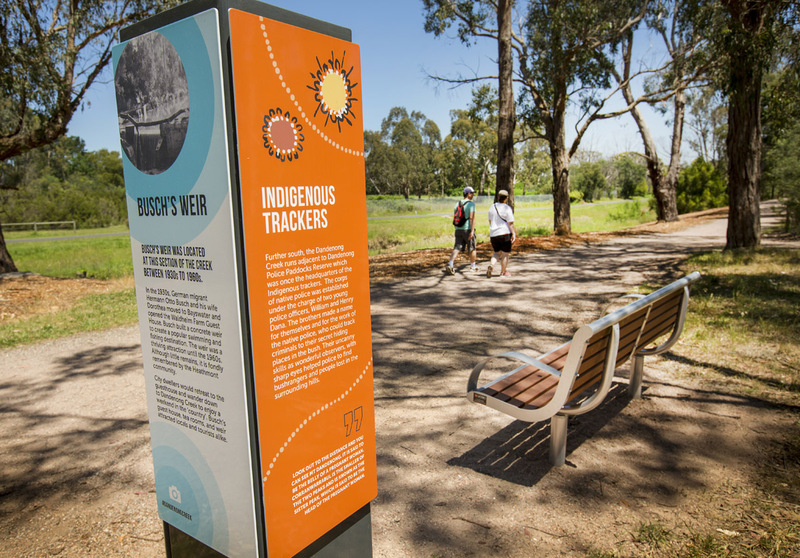 We created interpretive signage, some of which include artworks commissioned by Wurundjeri artist, Ash Firebrace. 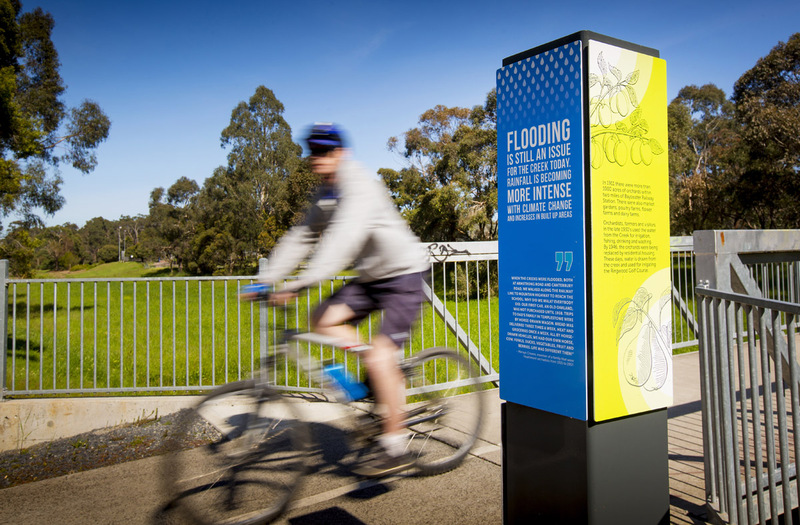 15 interpretive signs were installed along Dandenong Creek. We are working with the local council to construct the final billabongs. We are continuing to work with the local council to install additional amenities. This includes: drinking fountains, gym equipment and seating.